Autonomic regulation of heart rate (HR) as an indicator of the body’s ability to adapt to an exercise stimulus has been evaluated in many studies through HR variability (HRV) and post-exercise HR recovery (HRR). Recently, HR acceleration has also been investigated. 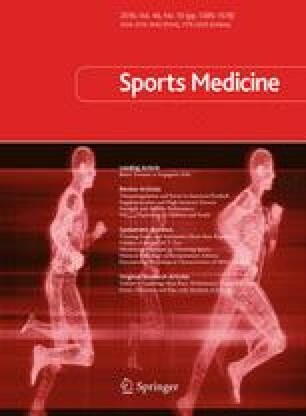 The aim of this systematic literature review and meta-analysis was to evaluate the effect of negative adaptations to endurance training (i.e., a period of overreaching leading to attenuated performance) and positive adaptations (i.e., training leading to improved performance) on autonomic HR regulation in endurance-trained athletes. We searched Ovid MEDLINE, Embase, CINAHL, SPORTDiscus, PubMed, and Academic Search Premier databases from inception until April 2015. Included articles examined the effects of endurance training leading to increased or decreased exercise performance on four measures of autonomic HR regulation: resting and post-exercise HRV [vagal-related indices of the root-mean-square difference of successive normal R–R intervals (RMSSD), high frequency power (HFP) and the standard deviation of instantaneous beat-to-beat R–R interval variability (SD1) only], and post-exercise HRR and HR acceleration. Of the 5377 records retrieved, 27 studies were included in the systematic review and 24 studies were included in the meta-analysis. Studies inducing increases in performance showed small increases in resting RMSSD [standardised mean difference (SMD) = 0.58; P < 0.001], HFP (SMD = 0.55; P < 0.001) and SD1 (SMD = 0.23; P = 0.16), and moderate increases in post-exercise RMSSD (SMD = 0.60; P < 0.001), HFP (SMD = 0.90; P < 0.04), SD1 (SMD = 1.20; P = 0.04), and post-exercise HRR (SMD = 0.63; P = 0.002). A large increase in HR acceleration (SMD = 1.34) was found in the single study assessing this parameter. Studies inducing decreases in performance showed a small increase in resting RMSSD (SMD = 0.26; P = 0.01), but trivial changes in resting HFP (SMD = 0.04; P = 0.77) and SD1 (SMD = 0.04; P = 0.82). Post-exercise RMSSD (SMD = 0.64; P = 0.04) and HFP (SMD = 0.49; P = 0.18) were increased, as was HRR (SMD = 0.46; P < 0.001), while HR acceleration was decreased (SMD = −0.48; P < 0.001). Increases in vagal-related indices of resting and post-exercise HRV, post-exercise HRR, and HR acceleration are evident when positive adaptation to training has occurred, allowing for increases in performance. However, increases in post-exercise HRV and HRR also occur in response to overreaching, demonstrating that additional measures of training tolerance may be required to determine whether training-induced changes in these parameters are related to positive or negative adaptations. Resting HRV is largely unaffected by overreaching, although this may be the result of methodological issues that warrant further investigation. HR acceleration appears to decrease in response to overreaching training, and thus may be a potential indicator of training-induced fatigue. No sources of funding were used to assist in the preparation of this review. Rebecca Thomson, Eileen Robertson, and Jonathan Buckley are the recipients of a recent Australian Research Council Linkage grant (LP140101013) that was awarded to investigate the potential for the HR acceleration parameter (maximal rate of HR increase) referred to in this review to track how athletes are tolerating changes in training load. This grant does not relate to the work described in the current manuscript, but is for future work. Clint Bellenger, Joel Fuller, Rebecca Thomson, Kade Davison, and Eileen Robertson declare that they have no conflicts of interest relevant to the content of this review. Jonathan Buckley invented the HR acceleration parameter (maximal rate of HR increase) referred to in this review, and the parameter is patented by the University of South Australia. The University of South Australia is seeking to license the technology for commercial gain, and Jonathan Buckley may benefit financially from any such license. Bellenger CR, Thomson RL, Howe PRC, et al. Monitoring athletic training status using the maximal rate of heart rate increase. J Sci Med Sport. doi: 10.1016/j.jsams.2015.07.006 [Epub ahead of print].